As an American, it is your god given right and responsibility to protect both yourself and your family from intruders who may try and enter your home. For this reason, it is important to be up-to-date on the latest and greatest technologies which are available to you. As the safety of you and your family is perhaps the most important thing you can protect, it’s important to invest in tactical gear that will be functional for the times you need it most. One of the primary tools everybody should have in their home is a high-lumen LED powered tactical flashlight. Although it’s primary function will be for those times when the power goes out, it will also be extremely helpful in the case of home intrusion. Gone are the days when flashlights were clunky and could hardly hold a charge as today you can have the power of a spotlight in the palm of your hand. My tactical flashlight also mounts on to the shotgun I keep in the drawer next to my bed which really helps in the case of an intruder. Another tool which is important to keep around the house are both tactical pens and tactical knives. Not only are tactical pens and knives multi-functional, they will be present when you need them most. 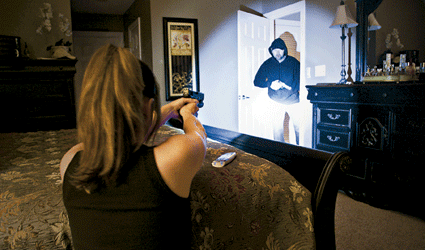 As home intrusion scenarios often happen when you expect it least, it’s important to have tools in every room to help you in the case you need it. Tactical pens are great for this especially if you have small children as to a child, a tactical pen will be nothing more than a normal pen. But for someone who knows how to use it, you can pierce the flesh of an intruder or break the window of an escape route. A tactical knife is something which is really smart to carry with you at all times. There are a variety of different models to consider but I really prefer the folding tactical knife as it can sit right on my belt and be extremely unobtrusive to my everyday life. In the case I need to use it, I can slide it out of it’s pouch to release a 4-inch blade which will be more than sharp enough to defend yourself with in the case of an aggressor. The above tactical tools are just the beginning. I encourage you to explore the options available to you in the tactical industry and find something which is right for you and your family.